With spring right around the corner, it's time to start thinking about your spring cleaning list. There's no doubt that you've already added cleaning behind the refrigerator, scrubbing out the ovens and going through those boxes in the basement or attic to that list. You're ready to start cleaning your home from top to bottom, however, have you considered adding taking care of yourself to that list? Your mouth works hard for you, and it deserves a little extra care. So, this spring, don't forget to add your teeth to your spring cleaning to-do list. You know you're supposed to visit the dentist at least twice a year. When was the last time you went? If you know it's been a while, or you can't remember, schedule an appointment now. 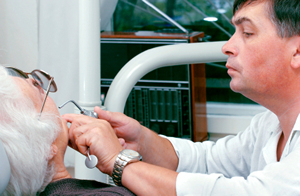 Your dentist will provide your teeth with a thorough cleaning and a comprehensive exam. The cleaning will help to rid your teeth of unwanted plaque, tartar and bacteria, while the exam will allow your dentist to spot any issues, and help you to get the treatments you need to avoid facing serious consequences. It's recommended that you change out your toothbrush every three to four months, sooner if the bristles are frayed. If your toothbrush is older than four months (or you can't remember the last time you changed it), invest in a new one. You may even want to consider upgrading to an electric toothbrush, which not only gets more strokes into your recommended two minutes, it also vibrates, helping to break up stubborn stuck on gunk. Having an oral hygiene routine is important for reducing your risk of developing tooth decay and gum disease. The ADA recommends that you brush at least twice a day (once in the morning and again at night) for two minutes. You should also be flossing your teeth, removing food particles, plaque and bacteria from between your teeth, at least once a day. Once you get in the routine, it will become habit. Food plays an important role in oral health. Certain foods, such as those high in sugar, can be detrimental, while others can help to boost it. Make sure you take a look at the foods you eat. Crunchy fruits and vegetables (apples, carrots, celery) scrub your teeth while you eat them and stimulate saliva production. Dairy products are high in calcium, which aids maintaining strong teeth. A well-balanced diet with fruits and vegetables, protein and grains will provide you with the best results. While your mind is on spring cleaning, don't forget the spring cleaning of your mouth. Contact our office for more information on how to optimize your oral health.